A small cup of vegetable juice beside a pile of green vegetables. Green smoothies and juicing are all the rage. These flavorful antioxidant-filled concoctions are a nutritious way to up your vegetable intake while reaping benefits for your skin and body. Choosing vegetable juicing or vegetable blending should be determined by your desired results, as there are benefits specific to each process. Although quite popular among health enthusiasts today, juicing is not a new concept. Disease.com attributes Dr. Norman Walker with inventing the first successful juicer that could be mass produced in 1930. Blending has been around quite awhile as well. 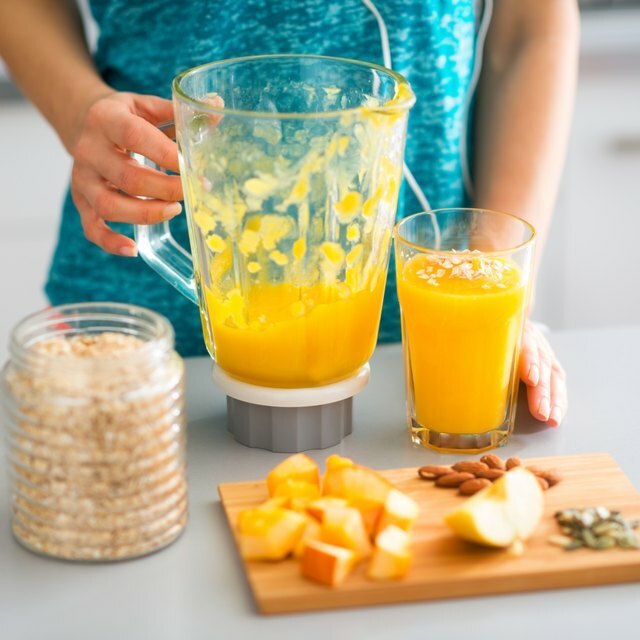 The first blender was a hand-held massager launched in 1910 by the Hamilton Beach Manufacturing Company but the first to place spinning blades at the base of a container was Stephen Poplawski in 1922, according to Blender Expert. Blending simply combines all the ingredients you place in your blender, leaving the pulp and fiber intact. Fiber is a healthy addition to your diet and can reduce your risk of heart disease and diabetes, according to MayoClinic.com. Another benefit of blending over juicing, notes Disease.com, is that there is a slower rate of sugar absorption. Making frozen drinks is easy with a blender as you can simply add frozen vegetables or ice to your smoothie. The ease of clean up compared to juicing is a plus to many who choose to blend rather than juice. Juicing is the act of extracting the pulp of vegetables or fruits, leaving the juice in a liquid, non-bulky state. Proponents of juicing cite absorbing nutrients more effectively as a benefit because your body is not expending energy digesting fiber. Other claims are that juicing helps with removal of toxins from your body and with losing weight, if done in a specific manner. The purity and high nutritional content of the juice that is extracted is valued among juicers. According to MayoClinic.com, there is no sound scientific evidence that extracted juices are better for you than eating the fruit or vegetable itself. Juicing can be used as a tool to get more fruits and vegetables in your diet, though, so to that end it is beneficial if you don't normally eat whole veggies. One of the benefits of both vegetable juicing and vegetable blending is that you can mix in vegetables that you would not ordinarily eat alone. If you don't like carrots, try them in a smoothie or juice them with other vegetables that you do like. Whether you choose to blend or juice your vegetables, you are nourishing your body with vitamins, minerals and antioxidants that have both short term and long term health benefits. Can You Prepare Smoothies in Bulk & Freeze Them?